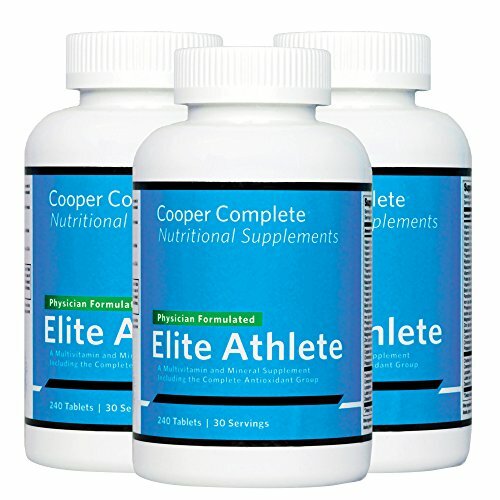 Developed by Dr. Kenneth Cooper, Cooper Clinic physicians and registered dietitian nutritionists, and a team of the country's leading researchers, Cooper Complete Elite Athlete Multivitamin is scientifically formulated for runners, cyclists, competitive body builders and weight lifters, and other athletes who push their body to the limit. The Cooper Complete® Elite Athlete Multivitamin & Mineral Supplement is designed to give elite or ultra-athletes, including marathoners, triathletes and those who exercise 5+ hours per week at 80% of their maximal heart rate, the supplements they need to perform their best. Cooper Complete Elite Athlete Multivitamin is recommended for adults ages 18 and older, who meet these stated requirements. This product contains NO yeast, wheat gluten, soy protein, milk/dairy, corn, starch, artificial coloring, preservatives or flavoring. The daily recommended serving is 8 tablets (4 tablets twice daily with meals). 240 tablets per bottle. 3 bottles; 90-day supply. Vanilla-flavored easy swallow coating.